Various opposition leaders like Congress president Rahul Gandhi, National Conference chief Farooq Abdullah, Delhi Chief Minister Arvind Kejriwal, and Trinamool Congress MP Derek O'Brien will also meet Chandrababu Naidu at Andhra Bhavan in New Delhi. The TDP had pulled out of the BJP-led National Democratic Alliance (NDA) over Centre's refusal to grant special status to Andhra Pradesh. N Chandrababu Naidu, who is on a 12-hr hunger strike against Modi over his demand of special status to Andhra Pradesh, said funds for developments projects in the state had not been given to his government. 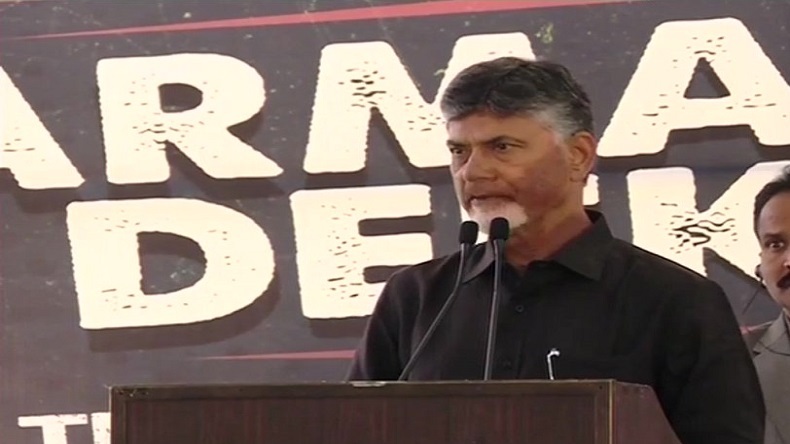 Modi government has done injustice to the people of Andhra Pradesh, said Chief Minister N Chandrababu Naidu while addressing his party workers at his dharna sthal. The TDP chief further said Prime Minister Narendra Modi went to Gutur to criticise him, but he has arrived in New Delhi to remind him of the promises he made to the people of Andhra Pradesh. If the Modi government won’t fulfil their demands, they know how to get them fulfilled, he said, adding that it is about the self-respect of the people of Andhra Pradesh. In a veiled warning, the Chief Minister said he is here to protest against the Modi government over the demand of special status to Andhra Pradesh. TDP MPs, MLCs and MLAs are also present at Andhra Bhavan. Earlier in the day, Naidu paid tributes to Mahatma Gandhi at Raj Ghat before he began his Dharma Porata Deeksha at Andhra Bhavan. Various opposition leaders like Congress president Rahul Gandhi, National Conference chief Farooq Abdullah, Delhi Chief Minister Arvind Kejriwal, and Trinamool Congress MP Derek O’Brien will also meet Chandrababu Naidu at Andhra Bhavan in New Delhi. The TDP had pulled out of the BJP-led National Democratic Alliance (NDA) over Centre’s refusal to grant special status to Andhra Pradesh.